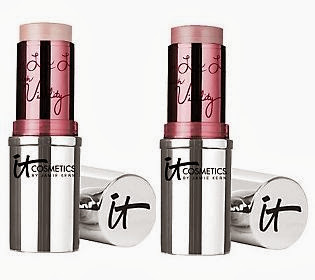 It Cosmetics Vitality Flush Stain Stick Lip & Cheek Reviver - $24 - the perfect multi-tasking product for a natural, glowing look in 2 shades: Je Ne Sais Quoi and Rose Flush - with a natural formula that contains hydra-luxe technology including rich butters and oils such as plum oil, cherry oil, shea butter, aloe and jojoba to treat, hydrate, condition and nourish while minimizing the appearance of fine lines and wrinkles. Along with anti-aging anti-oxidants - vitamins A, C and E, acai, green tea and white tea to protect from and ward off free-radicals to keep lips and cheeks vibrant and looking young. What I like best about it is how easy it is to use - just swipe a bit on your lips and the apples of your cheeks for a natural looking, lit-from-within glow that has great lasting power! Available at The Shopping Channel - www.theshoppingchannel.com in Canada and QVC.com, itcosmetics.com and beauty.com in the States.